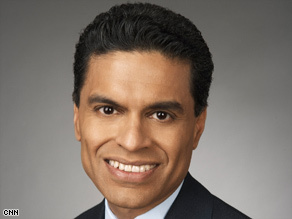 Zakaria says India vote means nation becomes a "recognized nuclear power"
Editor's note: Fareed Zakaria is a preeminent foreign affairs analyst and hosts "Fareed Zakaria: GPS" on CNN at 1 p.m. ET Sunday. Fareed Zakaria says this week's India vote signals a potential huge shift in balance between powers in Asia. NEW YORK (CNN) -- Indian Prime Minister Manmohan Singh won a vote of confidence this week, allowing his ruling party to keep in play a proposed nuclear partnership with the United States. A loss also would have doomed a nuclear deal, announced in 2006 and signed by U.S. President George Bush and Singh a year ago, that would expand U.S.-Indian cooperation in energy and satellite technology. The deal would give India access to U.S. nuclear fuel and technology for civilian nuclear power plants -- even though New Delhi, which tested nuclear weapons in 1974 and 1998, declined to join international nonproliferation agreements. The leaders of India's two Communist parties have accused Singh of surrendering India's sovereignty to the United States with the deal. CNN spoke to world affairs analyst and author Fareed Zakaria about this week's developments. CNN: What does the confidence vote in India mean? Zakaria: On the surface, nothing, because the government stays in power. But it's potentially a huge shift. The Congress Party now rules without the support of the Communist Party. The Communists have been a huge obstacle both on economic issues and the nuclear deal. CNN: What does it mean for the nuclear deal? Zakaria: India will now go forward with the deal negotiated with the United States. If all goes as expected, it will mean that India will become a "recognized nuclear power," in return for which its programs will be subject to some international scrutiny. Some nonproliferation hardliners are opposed to the deal, but they don't seem to realize that these were the only terms under which India would have been willing to come inside the nonproliferation tent. CNN: But India has nukes already, how does this make things different? Zakaria: In economic terms it means that India will now have access to nuclear technology from around the world. In geopolitical terms it is a huge shift. It marks the beginning of a new Asian balance of power, with India moving closer to the United States to keep a check on the growing power of China. CNN: What will an Indian government without Communist Party support mean? Zakaria: The government has the opportunity to jump-start economic reforms. Despite the sterling reputation of the current economic team, the Indian government has actually done almost nothing in terms of economic reforms. Its term so far has been a huge wasted opportunity. Now it has a second chance. It could put in places economic reforms, spur growth and investment, and move India to a higher growth trajectory. CNN: Will this make the U.S. and India get closer? Zakaria: I think that's already happening. India and the U.S. have been getting closer. Getting rid of the Communists will make the government-to-government relationship stronger. But there is also a society-to-society relationship that is becoming very deep. Every week, some delegation of Indians visits America and vice-versa. These two countries seem to understand each other. They're large, messy, chaotic, multicultural democracies. The wonder is it took them so long to find each other.